Scottish graphic designer Ian Macfarlane has won first prize in Dezeen's unofficial Brexit passport design competition with a cover that transitions between the burgundy EU passport and the dark blue of the old, pre-EU British passport. The London-based designer's winning proposal features a tonal gradient between the two colours, with the blue upper half seeping over the maroon lower half. The design was selected from the shortlist of nine designs announced earlier this month. The competition judges described the simple design as "poetic," "powerful," "elegant" and "ambiguous". Dezeen founder and editor-in-chief Marcus Fairs, who chaired the jury, said they were all struck by the simple power of the submission, which communicates Brexit in an ambiguous way. "It can be read as representing a smooth transition, a nostalgic return or an ominous darkening," he said. "This makes it a worthy winner, since the brief called for a design that would represent all UK citizens." Fairs described the winner as "an artistic statement that is ambiguous, powerful, simple and beautiful". "It represents the 52 per cent spray-painting over the interests of the other 48 per cent," said Guardian architecture and design critic and jury member Oliver Wainwright. "It is suitably sinister, like an overcast sky." "It is very poetic and elegant" added graphic designer Margaret Calvert. "This is a passport I would actually like to have. It is open to interpretation too." "It feels like part of history because it incorporates the colours of the current EU and the former UK passports," she said. "That is very important." "It talks about going back to pre-EU times," said Anita Taylor, dean of Bath School of Art and chair of the Council for Higher Education in Art and Design, who described the design as "concise and elegant". Macfarlane, 48, hails from Glasgow in Scotland but has lived in London most of his life. He described the competition as "a nice thing to think about". "It was a good idea for a competition," he said. "It's an important issue given the situation". In the statement accompanying his entry, Macfarlane wrote: "Britain needs a visual metaphor to honestly reflect the pre- and post-referendum spirit of the country and all those involved". Macfarlane wins a cash prize of £1,000. His design, along with other shortlisted designs, will be exhibited in the Design Museum in London and will be part of a display of more entries at Clerkenwell Design Week in London next month. The judges awarded second prize to London product design studio Special Projects. The design reinvents the traditional passport for the clubbing generation, giving it an iridescent cover, a shoulder strap and visa pages featuring personalised foreign phrases generated from biometric data contained within the passport, which the holder may find useful overseas. The aim of the design is to help travelling Brits fix friendships that have been damaged by Brexit by providing a trigger for conversations while travelling. Design Museum director Deyan Sudjic said it was the "perfect thing for Magaluf". "I like that it talks about the chatty nature of British people and the British obsession with queuing," said Wainwright. "It says something about passports themselves," said Calvert. "There is always a panic that you go through with your passport: 'where did I put it?' It's the same with your glasses. But with this one you have it there, round your neck." "Our design sheds the dark and austere colours of previous passports and instead uses iridescent coatings to signal the openness and willingness to chat of each Brexit Brit abroad," wrote Special Projects in its statement. "Passports are normally hidden in a hotel locker but we want people to actively use them, spreading happiness and laughter through human interactions." "Brexit has made the UK unpopular among its European counterparts and as a multi-European design studio who did not support it, we decided the UK passport should act as a tool to mend relationships post Brexit," it continued. "Our passport encourages UK citizens to engage with locals as they travel throughout the world, making friends and exploring mutual connections." Each visa page acts as a conversation guide specifically designed for that country, providing translations of friendly phrases, such as "Would you like to watch a football match together?" The passport makes use of the personal data captured inside to customise the phrases, so every single UK passport will have unique topics of conversation, such as "Did you know I was born 103 years after Albert Einstein?" Each passport has a loop of string which enables it to be worn over a shoulder for easy access. 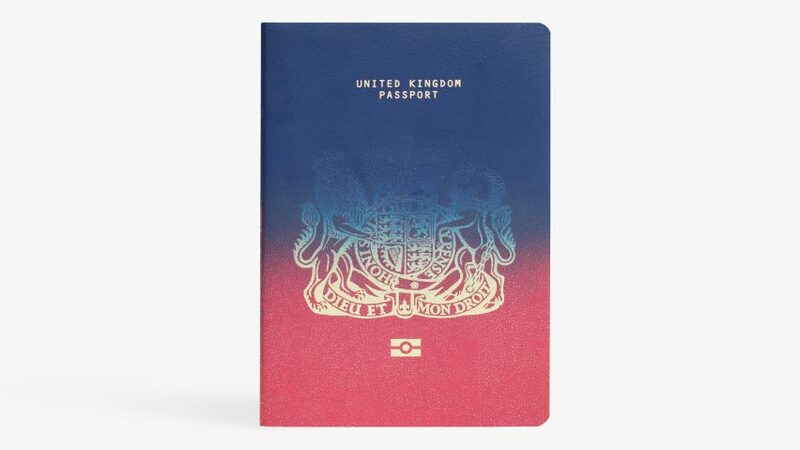 Our design sheds the dark and austere colours of previous passports and instead uses iridescent coatings to signal the openness and willingness to chat of each Brexit Brit abroad. Third prize goes to graphic designer Tim Gambell and Dutch designer creative director Alfons Hooikaas, co-founders of research platform Emblemmatic. Their project "uses computational techniques to explore symbols and their meanings". The duo's aim was to do away with the notion of nationality. Instead, they used the Emblemmatic toolkit to generate heraldic-looking imagery for passport covers based on the hometown of the holder. Meanwhile the visa pages inside are similarly personalised and decorated with imagery culled from the holder's social media profile. Fairs described the approach as "devolution gone granular" and said it showed up Brexit as a "black comedy". Wainwright said: "This tells a much stronger political and global story about the progressive isolationism and breakdown of nation states and unions, of bigger political ideas into inward-looking, insular elements. It is the ultimate extreme of localism, which can be read as a positive or a negative." Sudjic said: "It takes the Dutch to show us how stupid we are." The Brexit passport design competition was organised by Dezeen, which also provided the prize money. The purpose of the competition was to provoke people into thinking about the UK's identity after Brexit. The brief called for designs that represented all UK citizens while presenting a positive view of the country to the rest of the world. The competition received over 200 entries from 34 different countries. The youngest entrant was 12 years old and the oldest was 83. Blue covers and designs featuring the Union Jack were by far the most popular themes among entrants, even those from overseas. The shortlist of nine entries, revealed last week, received huge media attention and was featured on BBC TV and by publications including The Daily Mail, The Telegraph, The Guardian and the Evening Standard.